Today 23rd March marks the 87th year of martyrdom of Bhagat Singh, Sukhdev Thapar and Shivaram Rajguru. They symbolise the best example of sacrifice to free India from the imperial clutches of British rule. Indian history books perhaps have provided lesser exposure to their visionary battle against British rule. These revolutionaries envisioned India’s future were not in the same stream of Congress and did not garner that attention that the party gotten. From his early days, he had been attracted by revolutionary activities against oppressive British Raj. Seeking revenge for the death of Lala Lajpat Rai at the hands of the police, Singh was involved in the assassination of British police officer John Saunders. He eluded efforts by the police to capture him. Together with Batukeshwar Dutt, he undertook a successful effort to throw two bombs and leaflets inside the Central Legislative Assembly while shouting slogans of Inquilab Zindabad. Subsequently they volunteered to surrender and be arrested. Held on this charge, he gained widespread national support when he underwent a 116 day fast in jail, demanding equal rights for British and Indian political prisoners. He was convicted and subsequently hanged for his participation in the murder, aged 23. His legacy prompted youth in India to begin fighting for Indian independence and he continues to be a youth idol in modern India. Bhagat Singh and B.K.Dutt were sentenced to transportation for life on June 12, 1929 and both were sent to Multan jail and Lahore jail on l31h June 1929 by train. According to different files of Home Department of India related with J.P.Saundres Murder Case of Lahore, the Punjab Police and C.I.D. of Punjab Govt. was unable to trace the killer up to May 1929. Even the Police could not name the culprits. The Police was haunting in the dark but successfully made a strong case linking Browning Pistol No.l68096. We often attach great importance to the soil or the place and that way Khatkar Kalan is a historic village for it has given many famous patriots and freedom fighters like Sardar Kishan Singh, Sardar Ajit Singh, Sardar Swaran Singh, Shaheed-e-Azam Sardar Bhagat Singh. Nawanshahr situtated on the banks of river Sutlej is a city in Punjab which was upgraded as a district in 1995, now it is a municipal council in the district named after the revolutionary and is called Shahid Bhagat Singh Nagar district in Punjab. It reportedly was built during the reign of Khilji (1295-1316). In Sept 2008, in commemoration of Shahid’s 101st birth anniversary, Punjab CM Prakashsingh Badal announced the formation of a district after him. Bhagat & Dutt were sentenced to 'Transportation for Life' for the bombing on 12 June 1929. Bhagat Singh, Rajguru, and Sukhdev were charged with the murder. On 1st May 1930, by declaring an emergency, an ordinance was passed by Lord Irwin, that shifted the Lahore Conspiracy Case Trial from the court of Rai Sahib Pandit Sri Kishan to a Special Tribunal of three judges. On 7 October 1930, this tribunal convicted Singh among others and sentenced him to be hanged till death. 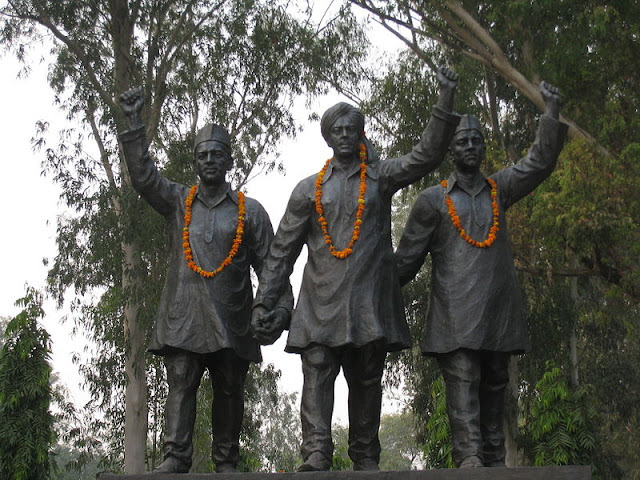 On 23 March 1931, Bhagat Singh was hanged in Lahore with his fellow comrades Rajguru and Sukhdev. Bhagat Singh was cremated at Hussainiwala on banks of Sutlej river. The court framed charges under Section 307 of the Indian Penal Code and Section 3 of the Explosive Substances Act. Bhagat Singh and Dutt were accused of throwing bombs ‘to kill or cause injuries to the King Majesty’s subjects’. The magistrate committed both of the revolutionaries’ to the sessions court, which was presided over by Judge Leonard Middleton. The trial started in the first week of June, 1929. Here also, Bhagat Singh and Dutt were irked by the allegation that they had fired shots from a gun. It was apparent that the government was not limiting the case to the bombs thrown in the Assembly. The two were persuaded to file an appeal which was rejected and they were sent for fourteen years. The judge was in a hurry to close the case and claimed that the police had gathered ‘substantial evidence’ against Bhagat Singh and that he was charged with involvement in the killings of Saunders. The case proceeded at a snails pace and hence the government got so exasperated that it approached the Lahore High Court for directions to the magistrate. When the case opened on 5 May 1930, Rajguru challenged the very constitution of the tribunal and said that it was illegal ultra vires. He argued that the Viceroy did not have the power to cut short the normal legal procedure. Sadly, Bhagat Singh, Rajguru and Sukhdev were sentenced to death in the Lahore conspiracy case and ordered to be hanged on 24 March 1931; but Singh was informed that his execution had been advanced by 11 hours on 23 March 1931, just a few hours before his execution. Singh was hanged on 23 March 1931 at 7:30 pm in Lahore jail with his fellow comrades Rajguru and Sukhdev. It is reported that no magistrate of the time was willing to supervise his hanging. The jail authorities then broke the rear wall of the jail and secretly cremated the three martyrs under cover of darkness outside Ganda Singh Wala village, and then threw the ashes into the Sutlej river. An ex-parte trial was against the principles of natural justice that no man shall be held guilty unless given an opportunity to defend in a hearing. It was probably for the first time, that executions were carried out in the evening, by advancing the date of execution. The families of the accused were not allowed to meet them before the execution nor were they informed about it, even the bodies of the three were not given to their relatives after the execution to perform last rites. Even lesser is known about the other two daring colleagues of Bhagat Singh. Shivaram Hari Rajguru (24 August 1908 – 23 March 1931) was born at Khed, near Pune. Years later, his birthplace of Khed has since been renamed as Rajgurunagar in his honour. Rajguru Market, a shopping complex at Hisar, Haryana, was named in his honour in 1953. Almost a century ago, there were different ideologies - the paths Gandhi and Bhagat Singh. Were they complementary could not be commented now .. in some ways, the Gandhian path was focussed on the transfer of political power but Bhagat Singh's vision was to transform independent India into better society. There has been criticism that Gandhi and other national leaders of that time, did not do much to prevent or reduce the sentence of 3 martyrs. Lord Irwin, in a report to the Secretary of State, penned his position on the issue of commutation: He (Mahatma Gandhi) did not plead for commutation, although he would, being opposed to all taking of life, take that course himself. He also thought it would have an influence for peace. But he did ask for postponement in present circumstances. I contented myself with saying that, whatever might be the decision as to exact dates, I could not think there was any case for commutation which might not be made with equal force in the case of any other violent crime.